North America Forum»Forum ›League of Angels ›Support › I am Silenced? I have been silenced in game? No warnings? No in game mails regarding this or a warning there of? really hoping this is only a glitch from new version update. I was chatting along in pm\'s and next thing i know a box pops up saying im silenced. 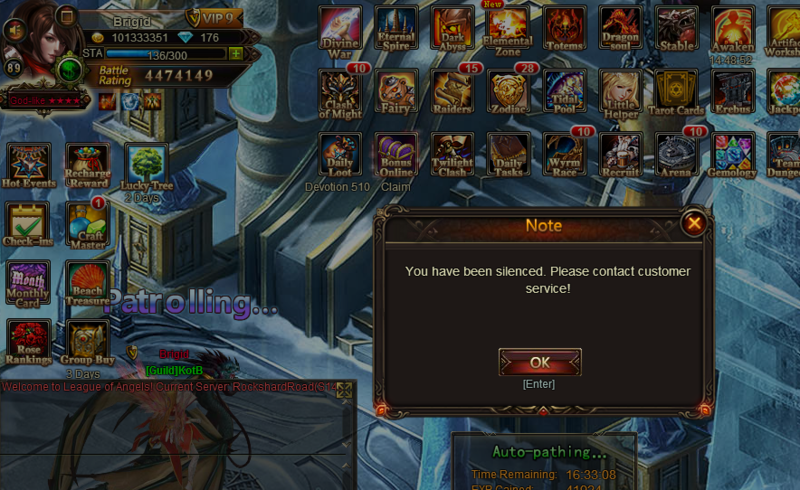 Hello there, can you please provide a screenshot with the msg where it says you are silenced? I will make a report for you and ask what and why that happened, but until Monday I will not get an answer. Edit: As happened before with players from another platform reporting here, I hope you are playing on GTA and not other platform. Because if it\'s another platform, you\'ll have to contact them. Oh no. I do play on the GTA platform. Dang, what about the 1st Amendment, Chinese companies do not recognize that? Your lack of a intellectual explanation is more of less leaving the readers confused, including myself. Half-witted sentences ;doesnt explain a whole lot. and if you were to read the 1st posting. There was no in game mail warning to a verbal or muting. Reading only a partial of any post usually gets you the response of your ignorance. And the US military friend, so if countries or people do not tread lightly, you better learn what B52 means. Ask ISIS what A10 means...Bet they know, don\'t they? 2019-4-22 16:53 GMT+8 , Processed in 0.089732 second(s), 52 queries .